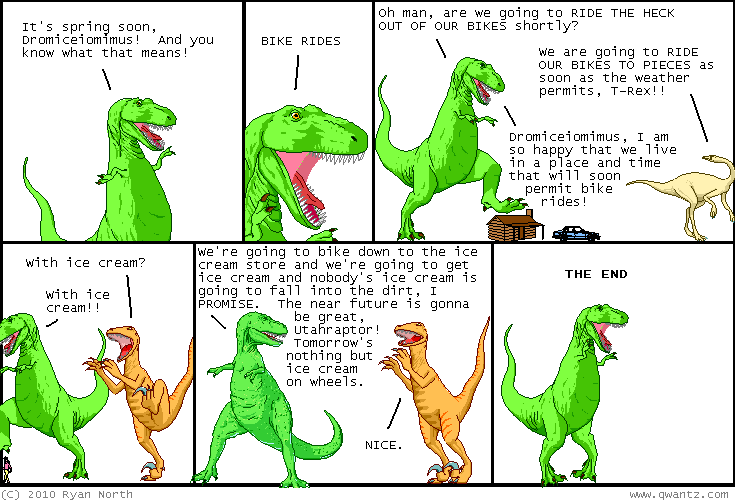 Dinosaur Comics - March 9th, 2010 - awesome fun times! –There's the modern age for you, cats and kittens! March 9th, 2010: Brad took the Qwantz Corpus I linked to the other day to help the efforts to solve my yet-unsolved anagram, threw in some Markov chains, and used it to write a program that generates new Dinosaur Comics automatically! He's posted some results and they're pretty awesome. Enjoy! One year ago today: "i've saved $3.55 in my life. $3.55 in 80 years. :0"